The incidence of cancer is going up. And an overwhelming majority of employees who have received a cancer diagnosis—particularly those with breast cancer—either want to or need to keep working through treatment. And employers are generally best served by having their experienced employees remain on the job and be as productive as they possibly can for as long as they possibly can. So, what can you do to support your employees, both before and after a cancer diagnosis, keep your company running efficiently, and manage the related health care costs? 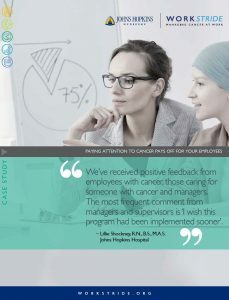 This case study outlines the steps Johns Hopkins took to build an employee benefit program that provided essential support to employees who are cancer patients or family caregivers as well as their workplace managers and supervisors. Learn more about how Work Stride: Managing Cancer at Work can benefit your employees.